--Calling all cooks! Love creating new dessert recipes? Use your creativity to win an Apple® iPad® as Girl Scouts of Eastern Missouri invites the entire community to take part in the “Bake Your Best” recipe contest. For the Bake Your Best contest, customers must use one or more items from Girl Scouts’ Fall Product Program and develop their own dessert recipe. To be considered for the competition, each participant must submit the recipe, a photo of the finished dessert and a photo of the cook with the Fall Product used. All submissions are due by December 10, 2014. The winner will be announced on December 17, 2014. Send submissions to bakeyourbest@girlscoutsem.org. Entries will be judged by the Council, 40 percent on creativity and 60 percent on photo presentation. New Fall Products this year are English Butter Toffee and Almond Cran-Orange Crunch while returning Fall Products include top-seller Deluxe Pecan Clusters, Chocolate Covered Pretzels in a Birdhouse Holiday Tin and Whole Cashews with Sea Salt. View all products here. For more information about the Fall Product Program, please click here. Girl Scouts is pleased to partner again this year with Ashdon Farms and M2 Media Group, which offer services for our community and the military through the Fall Product Program. Ashdon Farms provides a community service option, Project Thank You, where each $5 donation sends one can of candy or nuts to military personnel through the USO of Missouri. M2 Media Group offers new and renewed subscriptions to a wide array of popular magazines that are purchased online at lower-than-newsstand prices. Girl Scouts of Eastern Missouri is committed to building girls of courage, confidence and character who make the world a better place. 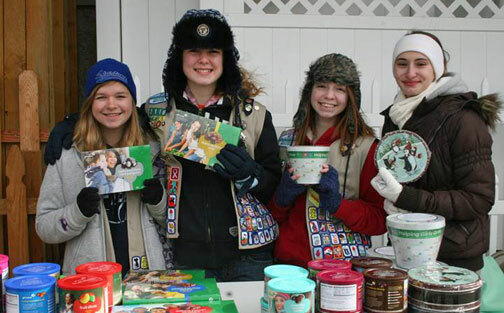 To join, volunteer or donate to Girl Scouts of Eastern Missouri, call 800.727.GIRL (800.727.4475) or visit www.girlscoutsem.org. Girl Scouts is a proud United Way member and is supported by the following United Way agencies: United Way of Greater St. Louis, United Way of the Mark Twain Area, United Way of Adair County/Northeast Missouri and Franklin County Area United Way. Follow Girl Scouts on...Twitter http://twitter.com/GirlScoutsEM and Facebook http://www.facebook.com/GirlScoutsEasternMO.